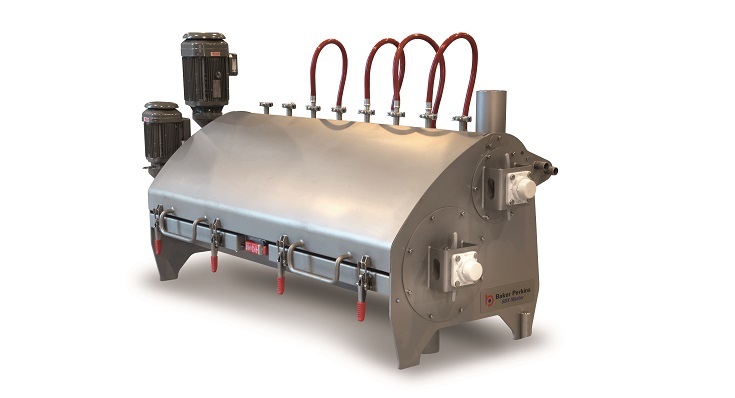 The SBX Master™Preconditioner mixes, heats and hydrates ingredients for processing in a Baker Perkins SBX Master™ Extruder. 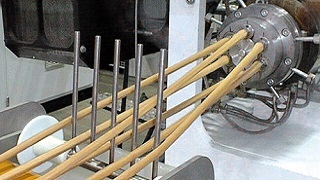 Cooking times and mechanical shear energy in the extruder are reduced, which widens the range of products that can be made on the extruder and maximizes both output and quality. Hygienic design and a wash-in-place spray bar reduce cleaning and changeover times. High-speed mixing and hydration take place in separate chambers, enabling the time and intensity of each to be controlled independently. The high-intensity mixing aerates the product which assists rapid hydration, while multiple feed ports give the flexibility to add ingredients at various points. Pelletized and half-products are cooked more quickly, allowing increased cooling time and preventing unwanted expansion, while the texture of protein-based products is improved by reduced mechanical shear energy. Unrestricted access to both chambers and an optional manually-installed water spray bar ensure cleaning is both quick and thorough. The vessel is fully sealed against steam and product leakage and the shafts are easily removable for additional cleaning. High efficiency direct drive motors sealed to IP66 for wash-down protection. Keyless shaft for easy maintenance. Replaces process insert when required for automatic pre-wash cycle (lid closed) prior to manual cleaning. Includes shaft rotation / reversing and dwell phases. 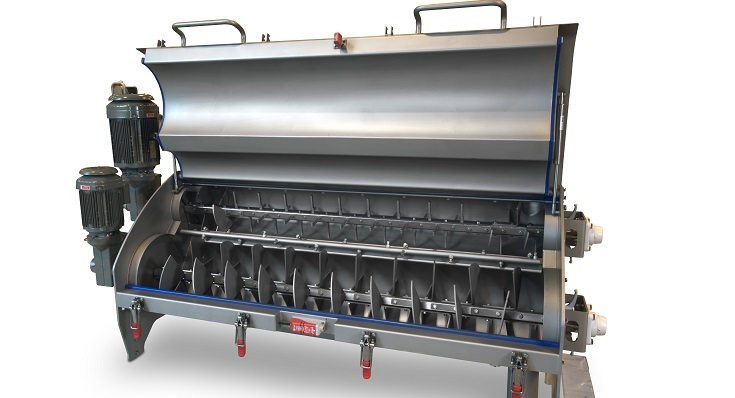 Open transfer chute is easy to clean and prevents aeration of the product to maintain bulk density. Interlocked top cover with ‘request to enter’ and gas struts for easy lifting. Allows unrestricted access to chambers for cleaning. 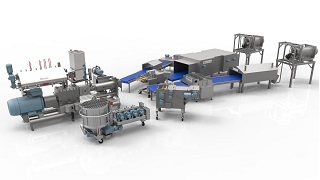 Multiple feed ports for process flexibility. Inlet and outlet at the same end plus vee-wheel mounting for easy bypass. Bolted assemblies allow paddle configuration to be easily changed. Quick release compression seals allow easy removal for cleaning and maintenance. Angled at 45º to provide cleaning access to bottom chamber. Sealed to avoid steam and product leakage.